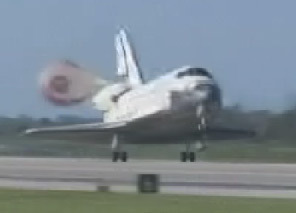 Space shuttle Atlantis wrapped its 32nd and final mission today when it touched down at Kennedy Space Center at 12:48 GMT. The venerable vehicle's final day in space began to the wake-up call of Muse's Supermassive Black Hole, played in honour of commander Ken Ham, who led the successful STS-132 mission to the ISS. The 12-day trip saw spacewalkers swap out six nickel-hydrogen battery units on the International Space Station's port truss. A total of three EVAs also included the installation of a new space-to-ground Ku-band antenna and the attachment of a spare parts platform to the robotic Special Purpose Dexterous Manipulator. Construction on Atlantis began in March 1980. It rolled out of the Palmdale, California, assembly plant in March 1985, and was delivered to Kennedy Space Center the following month. 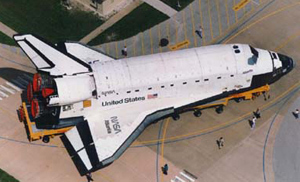 The shuttle's first flight was on 3 October 1985, when it carried a classified Department of Defense payload. The vehicle - "named after the two-masted boat that served as the primary research vessel for the Woods Hole Oceanographic Institute in Massachusetts from 1930 to 1966" - subsequently did four further Department of Defense flights, as well as carrying aloft planetary probes Magellan and Galileo and the Compton Gamma Ray Observatory. 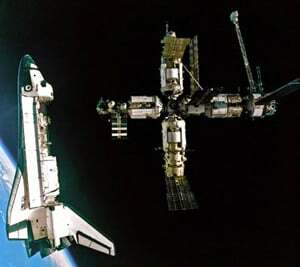 On 27 June, 1995, it headed off on the first Shuttle-Mir mating (pictured), and in 1996 returned to Russia's orbiting outpost to return astronaut Shannon Lucid back to Earth after her record 188 days in orbit. Atlantis was then tasked with ISS assembly and supply duties, along with the final Hubble Space Telescope servicing mission in May 2009. There are now two remaining scheduled launches before the rest of the fleet retires: Discovery's STS-133, set to blast off on 16 September; and Endeavour's STS-134, slated for launch "no earlier than mid-November".